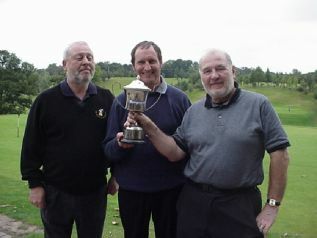 Everyone involved in the inaugural (2007) Mazda Bongo golf event agreed it was a great success. Chesterton Valley is one of the Midland’s hidden gems. The condition of the course was superb, and, the welcome given by the staff made this a most enjoyable experience. The weather for the practice round and the competition itself was perfect. The golf, in parts, was good too. In the evening, between the two rounds, we were fortunate enough to locate a first rate Chinese retaurant in nearby Wellington. Suitably impregnated with monosodium glutamate and alcohol, we slept well and awoke refreshed for the cut and thrust of the competition round. Battle commenced at 9am. By mid afternoon it was decided. The winner, as you can see from the pictures, was Paul Hinton (a local lad). He won it with 39 points, but, only on count back, from Tony Johnson. Your current reporter finished third. Paul has agreed to organise the event again next year and will defend his title. Who amongst us is man (or woman) enough to take it from him? After a few well chosen words to the cheering masses, and polishing off a drink on the winner, we went our separate ways content in the knowledge that we all had a great time, and, can’t wait for next years 2nd Great Mazda Bongo Golf Challenge.